Cameron Tower is one of the hundreds of glassblowers in Washington State making handblown glass pipes and bongs. His pieces are covered in waves of smoky color and handblown marbles containing celestial scenes. But there's something other than his artistry that sets him apart from the rest of Seattle's glassblowers. Tower invented the world's first modern bong. Sound crazy? Let me explain. Because glass pipes and bongs are ubiquitous now, stacked in piles at head shops across the world, they may seem timeless, but smoking weed out of a glass instrument is a fairly recent and distinctly American invention. And Tower is widely credited as being the first person to create a handheld, 100 percent glass water pipe. That's not to say that Tower was the first guy to smoke weed through a chamber of water. There's archeological and anthropological evidence of water pipes being used for thousands of years in Africa and Asia. But those early smokers used natural materials, not manufactured glass, to make their pipes. Natural objects like a coconut in Jamaica, the hollow wood of bamboo in Thailand, or a dried gourd in Africa can all be fashioned into a water-filled smoking apparatus. Tower is also not the first person to make a glass pipe. Humans have been manufacturing glass for thousands of years, and crude glass pipes have likely been made since Romans first blew glass vases. But it took the American studio glass movement of the mid 20th century to refine pipe making. A guy named Bob Snodgrass is credited with developing the glass-pipe-making techniques used throughout the world today while touring with the Grateful Dead in the 1970s and '80s. Snodgrass eventually settled down in Eugene, Oregon, which is where Tower headed in the spring of 1993, hoping to learn how to make glass pipes. "I didn't have a place and he didn't know I was coming, but I had to make that dream happen," Tower said. Snodgrass was already working on a glass water pipe when Tower got to Eugene, but Snodgrass was unhappy with its awkward construction. The pipe involved a removable bowl and down stem, the glass piece that sends clouds of weed vapor through the water and into the bong's main chamber. Tower took that idea and literally fused it all together to make one solid glass piece that could hold water, be cleaned fairly easily, and have enough durability to last for years. Hookahs and some crude bongs made with a mix of ceramic and glue existed before these pipes, but this was the first water pipe made out of a single fused piece of glass. These first water pipes resembled hammers and could be held in your hand. It took another year before Tower and a few other artists started making what's thought of as the classic bong shape—an upright tube extending out of a bubble at its base, with a down stem and bowl fused into that bubble. It may be easy to write off an innovation in something as seemingly trivial as a piece of pipe paraphernalia, but it's incredibly rare for any artist's hand to be involved in the creation of something as universal as the modern glass bong. These things have been replicated millions of times by artists around the world. If Tower got a penny for every bong made in the world, he could buy a penthouse in Belltown, but the spread of glass water pipes only made it more difficult for Tower to make money. "Even if it gave someone in Pakistan or India a job, then I guess it's a good thing, but it's hard when the shops are asking $15 for something we used to sell for $100," Tower said. There's a new high-end market for glass pipes, but Tower has been largely overlooked by collectors of these five- and six-figure bongs. That's because Tower migrated into the world of sculptural glass and spent more than a decade working at famous glass production studios in Seattle like Glassybaby. "I quit making pipes and went into the soft-glass world and became an anonymous factory worker making gift glass," Tower said. Now he's back in the world of pipe making, banging out bubblers and dab rigs in the garage of his two-bedroom White Center home. But the pipe money has yet to start pouring in, and an unsteady roommate situation has left him short on monthly mortgage payments and at risk of losing his house. 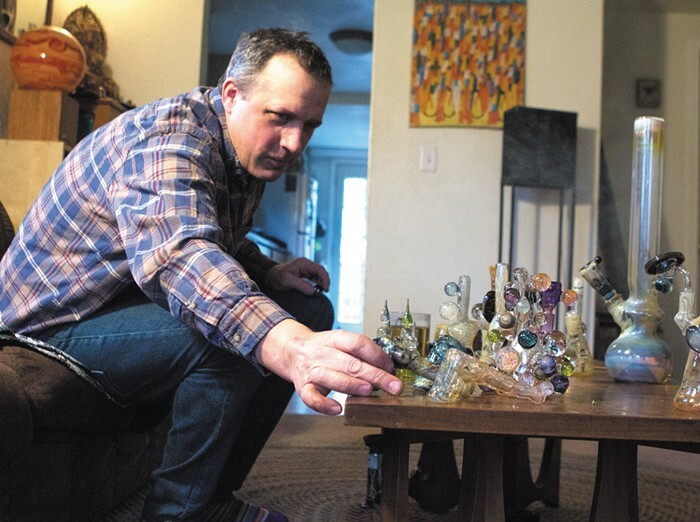 As Tower closes in on 50, he is keeping the hustle alive, making money by renting a room on Airbnb and trying to promote his glass pieces on the internet. Find him on Instagram (@c_tower_studios) if you want to smoke your next bowl out of a piece of history.